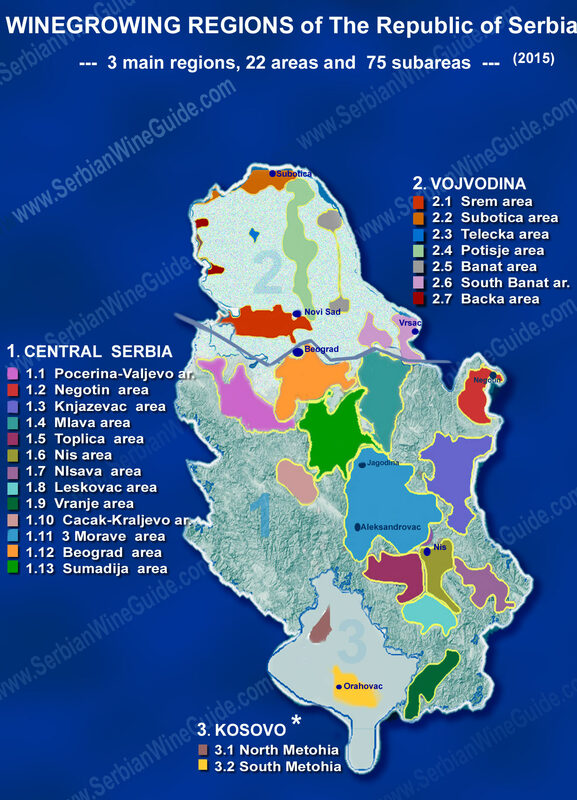 Since 2015 the Republic of Serbia is divided into three main wine-growing regions : Cental Serbia, Vojvodina and Kosovo*. The State census of agriculture 2012 it showed the following results : In Central Serbia, there are about 13 500 hectares of wine grapes ,and it consist of 13 main area which are divided into 57 subareas. The Vojvodina region approximately has 4400 hectares of wine grapes, and and it consist of 7 main area which are divided into 17 subareas. In the Kosovo* , State census of agriculture 2012 could not be done due to the circumstances, and real, fresh information is not available. (Kosovo* is an area that ( up to the civil war in 1999) was a part of Serbia. Now it is territory under the protection of UN and waiting to become an independent state.). 13 300 ha , 13 main area and 57 subareas. Vojvodina belongs to the Pannonian Plain and the central Serbia is in the middle of the mountains of the Western Balkans.. This, and some other climate, historical and cultural differences, reflected to the difference in types of grapes that are grown and style of wine making and consuming by particular regions. Northerners prefer strong white wines with a lot of acid and aromatic, and not too strong red,. As we go more to the south white wines are becoming aromatic , and red wines becoming very strong and full of flavor. Today, with the increase in planting of international varieties and unification of wine tastes under one global direction these differences have become smaller.